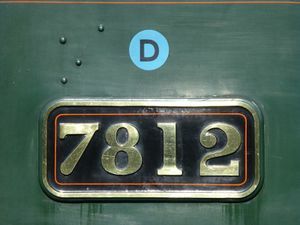 The cab side of GWRGreat Western Railway locomotives from the 1920s onwards carried a coloured disc bearing a letter. The colour of the disc showed the locomotive’s axle weight classification, which determined which routes the locomotive could work on. The letter showed the locomotive’s power classification, which was used to determine the maximum load it could haul on each route. Certain routes could be modified as “dotted”, for example "Dotted Blue" meant a route could be worked by "Blue" locomotives but subject to a 25mph speed restriction. Locomotives in the lower "Yellow" and "Uncoloured" classes could work the route without this additional speed restriction. The axle weight was the main factor used in determining route colour, but this could be varied where it was considered appropriate. An example of this was the 5700 class pannier tanks, which were reclassified from "Blue" to "Yellow" by BRBritish Rail or British Railways(W) in 1950. The reason given was the low 'hammer blow' that the class produced, which reduced the wear on the track. Engines in the “Red” group (with the exception of the ‘King’ and the 2-8-0 47xx Class) may work between Hartlebury and Bewdley, subject to the maximum speed not exceeding twenty miles per hour at any point, also to strict adherence to the following prohibitions and restrictions. Engines in the “Blue” group (with the exception of the 2-8-0 types) may work between Bewdley and Iron Bridge and Broseley, inclusive, at a maximum overall speed not exceeding 25 miles per hour at any point, subject to the following prohibitions and restrictions. Engines in the “Red” group (with the exception of the ‘King’ and the 2-8-0 47xx Class) may work over the running lines only between Buildwas and Shrewsbury, provided the speed does not exceed 20 miles per hour at any point and subject to service restrictions. John Marshall’s history of the Severn Valley Railway also states that special rules applied to 51xx and 81xx ‘large prairies’, which were subject to a 25mph restriction between Victoria Bridge and Linley. The maximum permitted line speed between Hartlebury and Shrewsbury was 50mph. The additional prohibitions and restrictions referred to mainly related to sidings and weighbridges, although there were details restrictions on the working of locomotives over Victoria Bridge. Any engine in the “Red” group (excluding the ‘King’ class and the 2-8-0, 47xx Class) may work between Kidderminster and Bewdley subject to the maximum overall speed not exceeding 20 miles per hour. Engines in the “Yellow” group may work between Bewdley and Woofferton subject to service and special speed restrictions. Engines in the “Blue” group are authorised to work between Bewdley and Woofferton at a maximum speed of 25 miles per hour subject to the following prohibitions and service speed restrictions. As with the Severn Valley Branch, the overall line speed was limited to 50 mph, while the prohibitions and restrictions mainly related to sidings and weighbridges. For each route, the working timetable included a table of locomotive classes and the maximum permitted load. For example the 1948 working timetable specified that a ‘small prairie’ such as 4566 was limited to a load of 310 tons between Hartlebury and Shrewsbury, although a load of 335 tons was permitted for “trains liberally timed”. The power classes and loads did not differentiate between Passenger, Freight and Mixed traffic working. After nationalisation, BRBritish Rail or British Railways adopted a more refined system. Route Availability was based on classes RA 1 to RA 10, while locomotive power was based on classes 0 to 9 with distinctions made for Passenger, Freight and Mixed Traffic. However the old system continued to be used on ex-GWRGreat Western Railway locomotives on the BRBritish Rail or British Railways Western Region. When the SVRSevern Valley Railway began operations in 1970, the line was still subject to the 17 tons 12 cwt axle weight restriction. This meant that large locomotives such as 61994 The Great Marquess could not be used until a program of upgrading the line had been undertaken. The successful completion of this means that the SVRSevern Valley Railway has since hosted a GWRGreat Western Railway 'King' class locomotive, as well as similar classes of locomotives from other companies. However Victoria Bridge remains subject to operating procedures which restrict the double-heading of locomotives. The Light Railway Order under which the SVRSevern Valley Railway operates specifies a maximum speed of 25mph for normal services. Operation up to 50mph may be carried out between Kidderminster and Bewdley when the railway is closed to the public; a recent example being the testing of Metropolitan Railway 0-4-4T No 1 in 2012 prior to its participating in the London Underground events in 2013. ↑ Marshall (1989) p. 137.